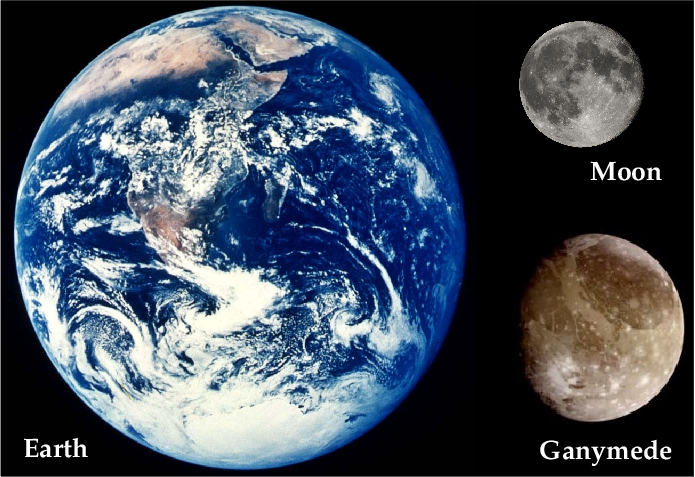 Ganymede compared to Earth and the Moon. 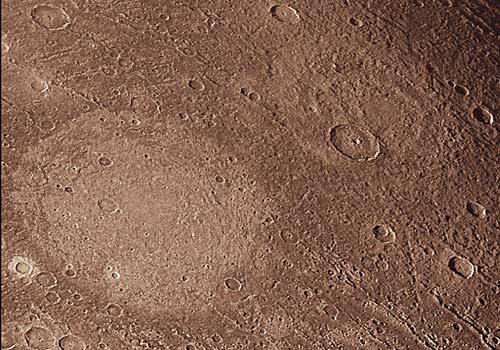 Witness a moon much larger than Earth’s Moon, and bigger than the planet Mercury. Witness a moon with a barren icy surface like its neighbor Europa, which may hide an ocean of saltwater, similar to Enceladus. Witness a moon that orbits the largest planet in the Solar System, and is the only moon known to have its own magnetic field, yet has only a thin oxygen atmosphere. That moon is Ganymede, one of the four Galilean moons discovered in January of 1610. Its diameter is 41% of Earth’s, putting it between Mercury (38%) and Mars (53%) in size. Ganymede’s structure is complex: most of its mass is in a molten iron core with a mantle of rock surrounding it. As with Earth, the molten core produces a magnetic field, though Ganymede’s field is much less strong, swamped by Jupiter’s powerful field. Outside the core is a thick sandwich of water ice (possibly mixed with ammonia), whose filling may be a salty ocean; rocks from the depths are trapped in the ice. In some ways, it seems as though a tiny terrestrial planet became frozen over. Since water ice is much less dense than rock, the 800 kilometer- (500 mile-) thick ice shell contributes far less to the rotation of the moon than the core. 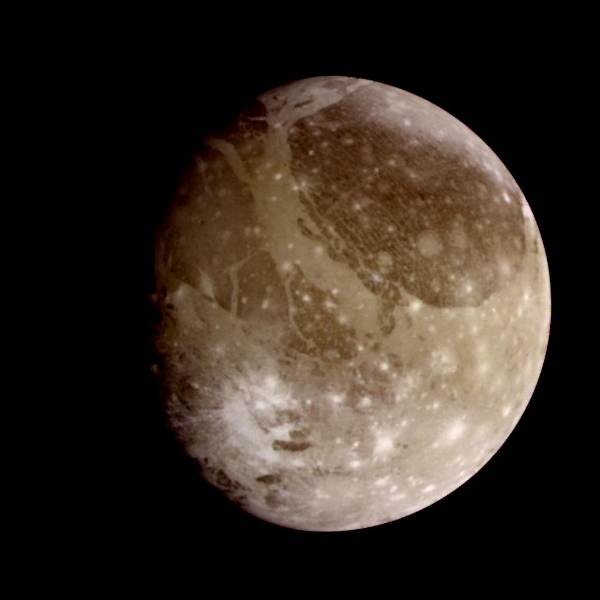 Ganymede as seen from the Galileo probe. The dark coloration is due to sulfur dioxide, also seen on Io. Like so many other moons we’ve examined, Ganymede is tidally-locked to Jupiter. The side facing the giant planet is lighter in color than the side facing away (shown in the image at left). The dark coloration comes from sulfur dioxide, a compound we also see on Io, Venus, and volcanoes on Earth. Ganymede, unlike Titan, doesn’t have a substantial atmosphere, but it does possess a tenuous veil of oxygen (O2) and ozone (O3), discovered by the Hubble Space Telescope in 1996. A palimpsest on Ganymede: a crater that filled with melted water from the impact, which subsequently refroze, leaving a lighter-colored region. Last week, the Kepler team announced the discovery of three small planets orbiting the tiny red star KOI-961. The star and its attendant planets are so minuscule that the resemblance to Jupiter and its moons is striking. Perhaps formation occurs on a variety of scales: big stars have big planets, and those planets form moons in regular orbits, making their own “planetary” systems within the larger star system. Looking at Ganymede (as well as Titan, of course), we see a large planet-like object in orbit around its “star”, Jupiter, made of hydrogen and helium much as our Sun is.